If any quote encompasses the past three weeks, it’s been this. Work was tough, especially last week. I won’t lie: there were a few days that I came home, plopped on the couch and cried. I was tired and frustrated and scared. While I really enjoy what I do, it’s difficult to work long hours and feel like that’s not enough. Or to find out that a marathon week was made incredibly longer because someone failed to plan accordingly. Or to realize that, despite best efforts to stay calm and collected and professional, someone can disrupt that zen-like calm with an angry outburst. In the midst of this craziness, on one of the worst days, B convinced me to just escape with him for an evening and get to the sea. We visited a local, hallmark seafood restaurant to eat chowder and fish and chips. The restaurant was on the water, with huge open windows, so I had a cooling ocean breeze to clear my head of bad thoughts. After dinner, in the dark, we walked along the shore and simply breathed the salty air. We found a jetty and, disregarding my normal qualms about hopping along the rocks, I forced myself out toward the end and relished the adrenaline rush it brought. Ok, two out of three, not bad. But where’s the sweat? I started running again! During a recent trip to the gym, I hopped on the treadmill and started to run. It felt horrible and wonderful all at once: I was hot and gross within minutes, but exhilarated at the thought of running miles again. Of being a “runner” again. I’ve promised myself at least one 5K this fall, so I have a goal to build up to within a manageable timeframe. I even bought a new pair of running tights and tank as encouragement! During the last few weeks, I’ve asked B to take photos only a couple of times. This is one of my favorite outfits recently. 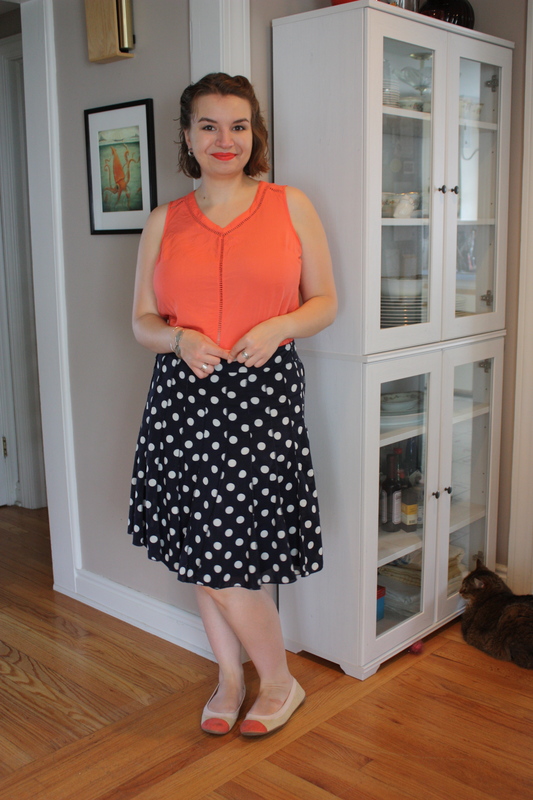 I love the pop of coral against the polka dots. 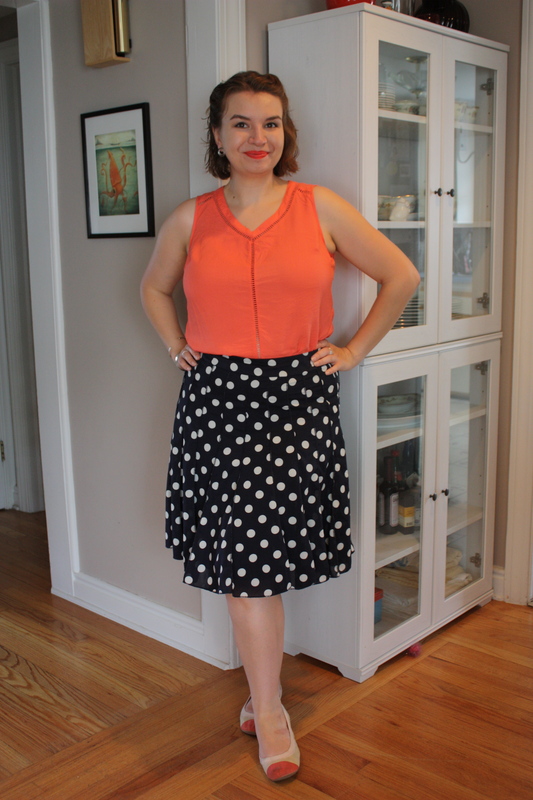 And, yes, I’m one of few ladies in the world who can easily match their blouse, shoes, AND lipstick without trying.